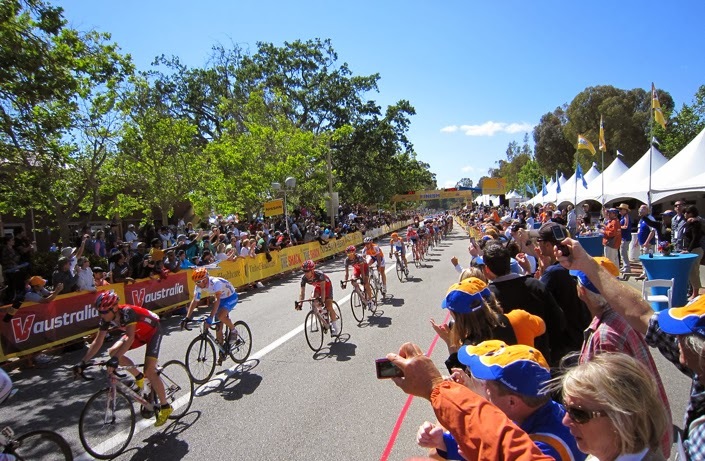 It's called L'Etape du California, that ride where cyclists take on one complete stage of the Amgen Tour of California. This year the event will take place on Sunday, April 6, 2014. 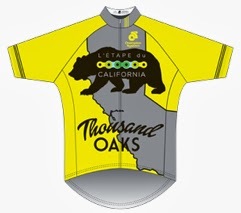 A maximum of 1500 cyclists will complete the 80-mile route of Stage 8 of the 2014 Tour of California in the city of Thousand Oaks. 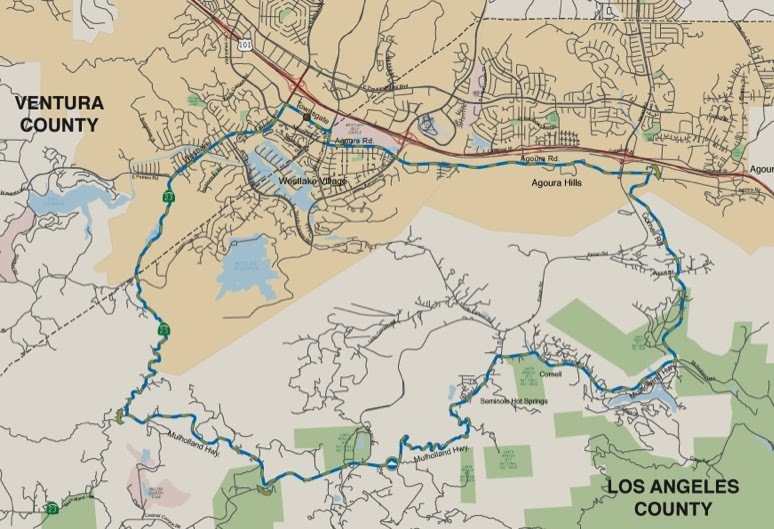 The start and finish line is in Westlake Village, riders will climb the famed Rock Store climb on Mulholland Drive four times. This is a timed event with recorded results and bragging rights. This is also a good hard day in the saddle for the remaining 1,499 riders who will not win the 2014 Etape du California. With it's good location and Sunday ride time - this event should attract plenty of riders. This year's Stage 8 (the same stage of the Etape) is very similar to Stage 8 of 2010 Tour of California. Ryder Hesjedal of Canada won the stage that day in 2010. This year you could be the one. Route: 20+ mile circuit route, 4 loops, 80-miles total. Start/finish line on Townsgate Road/Village Glen in Thousand Oaks (really it is Westlake Village), heading south to Agoura Hills, starting the ride along Mulholland Hwy past the Rock Store at the foot of the climb, followed by a very technical descent back to Westlake Village. Repeat three more times. 8,800ft total elevation gain. If you fly in for the event, consider both LAX and Burbank airports for arrival. Burbank is actually an easy location to get in and out of quickly, and only a 40-minute drive to Westlake Village (in light traffic). It'll take you that long just to walk through LAX. Westlake and Thousand Oaks are nice pleasant suburban locations with chain hotels and strip malls filled with shops, restaurants and coffee shops. Parking is easy with street parking and some limited for use parking lots. If you need a hotel, the host hotel Hyatt Westlake Plaza, has $139 rooms available through March 10th only. My parents live nearby in Camarillo, Calfornia, but I will miss this great ride this year. I will be the for the 2014 Amgen Tour of California however. Cost: $90 from February 2 through March 28, $110 from March 29 through day-of-even. You can pay $255-275 for VIP if you desire "preferred placement" in the roll out and a free photo of yoruself. Or you can go cheap and try to pass 987 people through out the course of the race (ride). Support: nutritional and mechanical on course. Prizes: every rider receives a medal (!) and a tshirt. Plus you will be included in the KOM timed climbing competition (whether you like it or not). 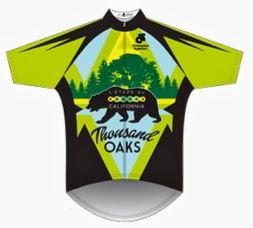 Jersey are an extra $90, Champion Systems may no longer sponsor a pro cycling team, but they still make jerseys. L'Etape du California is modeled after L'Etape du Tour,. A major event run in France annually to allow citizens to ride one complete stage of the Tour de France. The tradition is a marvelous one, because nothing is better than getting out and riding on the route yourself and then watching the pros do it (much faster). Etapes are very much like gran fondos (both are timed citizen rides), only L'Etape du California and L'Etape du Tour are run in conjunction with a pro stage race, allowing the amateur to test his/her time against the pros. The word etape means stage in the French language. So you will be riding The Stage of California. This year the riders who challenge themselves on the 2014 L'Etape du Tour will have to wait until May 18th to watch the pros do the same on the final stage of the 2014 Amgen Tour of California. Volunteer if you are interested in helping. Photographs of all cyclists will be available after the event at: Finisher Pix. I will be writing much more about the Tour of California in coming weeks. I love this stage race. TOUR OF CALIFORNIA. VeloNews recently included the Etape du California on their Bucket List: 17 must-do rides and races in North America.